Thousands of demonstrators from largely Francophone Cameroon’s English-speaking minority took to the streets to demand more rights on Friday, some of them hoisting separatist flags. Two Anglophone regions in the west account for about a sixth of Cameroon’s population. Long-standing complaints of political and economic discrimination spilled over there last year when lawyers and teachers called for reforms. Security forces killed six protesters and arrested hundreds of others, and the internet was shut down in the region from January to April, crippling businesses in a crackdown that was condemned internationally. 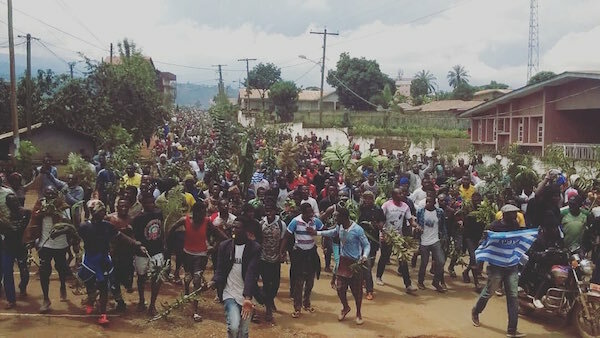 Friday’s protests were the largest and most widespread in months and came the day after a bomb suspected to have been planted by separatists wounded three policemen in Bamenda, capital of the Northwest region. The protests appeared to go beyond previous demands for justice and education reform. In Buea, capital of the Southwest region, a Reuters reporter saw protesters take down a national flag outside a police station, while officers looked on, and hoist the blue and white striped one of “Ambazonia”, a name for the Anglophone territory. A local journalist described a similar incident in the nearby town of Ekona. In Buea, young men with their faces painted blue and white blew whistles and shouted “We want freedom!”. Some Anglophones have been demanding independence for years, but they are outnumbered by those merely demanding reforms, experts say. Still, the unrest is uncomfortable to the government of President Paul Biya, who has been in power for 35 years and was addressing the U.N. General Assembly in New York on Friday. “It is intensifying now. It has shifted to another level of extremism,” said political analyst Albert Nchinda. Cameroon’s linguistic divide harks back to the end of World War One, when the League of Nations divided the former German colony of Kamerun between the allied French and British victors. After independence in 1960, the English-speaking part opted to join French Cameroon instead of Nigeria. Your opening sentence is contradictory. It should have read "Thousands if demonstrators from largely Anglophone Cameroon's minority English speaking …"